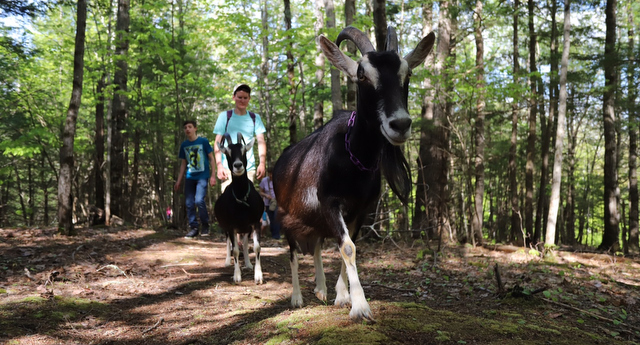 Hike through the Ten Apple Farm woods with our herd of Alpine dairy goats! Our evening hikes start with goat milking, then the hike, and finish with goat milk and homemade cookies back at the farm. The hike consists of an approximately 1 1/2 mile loop through the woods on fairly well maintained trails. There is some steep terrain. Children must be at least 5 years old and accompanied by an adult. (Children under 4 must be carried). Along the way we’ll talk about goats as pack animals and you’ll learn a thing or two about raising and caring for goats. $10 per adult, $5 for kids (ages 5-11). Postponement due to weather: We can’t take the goats out if it’s raining. We will be watching the weather forecast in the days leading up to the hike and will let you know within 24 hours of the hike time whether the hike is a go or not.